Father God, there are no words grand enough to capture the depth of our gratitude for who You are and all You’ve done . . . all You’ve done for the sake of Your love for all the people You’ve created in Your image. Sometimes it’s easy to minimize, or just not think about, the magnitude of what You did when You chose to put on flesh and dwell among us. Thank You, Father, for sending Jesus−fully God and fully Man, born as a babe, grown to manhood, and now reigning as the Risen King and the only High Priest who understands everything we could possibly experience in our human frailty. Thank You for the gift of Your Holy Spirit, He who dwells in us when we repent, surrender our lives and accepting Jesus as our personal Lord and Savior. Too often, we ignore the Holy Spirit when He nudges us toward Your Word. We shy from reflecting on the immensity of Your suffering from the moment Your beautiful holy feet touched this dusty earth You created . . . to the moment You ascended back to Your rightful Heavenly throne. You willingly took our place on the cross, paying the cost for our sins of yesterday, today, and even tomorrow. Your love endured the punishment meant for us−sinners in need of saving−as You loved even those who beat You, mocked You, spit on You, and hated You. Forgive us for the moments we whisk past the Good News as if it’s old news, Lord. You, Heavenly Father, gave Your only Son−Love’s greatest gift−so that those who believe in Him will have eternal life. Please don’t let us ever forget that eternal life begins now, with the privilege of knowing You personally, interacting with You intimately, and living for You abundantly. Please create new hearts in us, hearts that love the Light, that love Your Truth, that live to love others like You love . . . because You first loved us. We are Your beloved ones, Lord. Do what You will, Father, and help us trust Your enduring love . . . yesterday, today, and forever. Photo taken by and used with permission from my amazing husband, Dr. W. A. Dixon, Sr.
Why Should I Love God When the Pain Feels Endless? I didn’t want to need a cane. I didn’t want to need medication. And I didn’t want to need help during the 2017 West Coast Christian Writers conference. I wanted to feel strong, to be strong . . . to be content in the peace of complete healing on this side of eternity. The whiny tone didn’t take long to bubble up: Why, Lord? How long? When will the pain end? That pity-party mentality had me teetering on the brink of insanity and shoved me further away from serenity, so I asked God to help me submit to the now. The only way I could experience that coveted contentment I longed for would be through complete surrender to the freedom of total dependence on and trust in God. I wasn’t going to get better before the conference, unless the Lord decided to bless me with a miracle. Oh, I believe He could have. I still pray for and believe God can grant me a miracle of instant healing. But I’m learning how to lean into longsuffering, not always gracefully but willingly submitted to the Holy Spirit. So, I packed my cane, accepted I’d have to take pain medication, and planned to make time to rest during the conference. Peace, smiles, and gratitude replaced my pouting, scowls, and grumbling, allowing me to witness God working in ways I’d never be able to imagine. The pain didn’t go away, but neither did my joy. I met speakers, teachers, and other conference attendees with ailments. Some used walkers. My husband hobbled around on crutches, still recovering from knee surgery. The Lord allowed me the privilege of hearing countless testimonies of how He sculpted suffering into beautiful messages of grace, messages writers could share to minister to others for His glory. Cancer didn’t stop books from being written. Depression didn’t hinder Bible studies from being published. Gods’ faithful scribes relied on the Holy Spirit and shared the words God gave them during their wilderness journeys. The Lord used every beautiful voice, crafted every brave story, and redeemed every broken dream. Some spoke from a place of deliverance. Some, like me, continued to write from the trenches of the wilderness, still hurting, still hindered, but still hoping in the One who is able to do above and beyond anything we could ever begin to imagine. I still grieve when I consider the fact that, though God is absolutely able to bless me with a miracle of His healing mercy, physical healing may not come on this side of eternity. But as I inhale His promises and exhale pure peace, the Holy Spirit empowers me to whisper praises to the Father. God will reveal His glorious purpose in His perfect timing. Pain, whether physical, emotional, mental, or spiritual, is not fun. But it’s not worthless, either. Knowing this truth helps, but it doesn’t make praising God through the hurt any easier. And it doesn’t stop me from falling apart, from grieving, pouting, or crying out in desperation when frustration, weariness, or despair set in. But peace prevailed after I realized it’s okay to feel, to struggle, to process mixed emotions, to wail, and to admit I need God to be my strength and sustaining hope. The psalmists affirm that God invites us to process raw feelings when we’re overwhelmed and hurting. 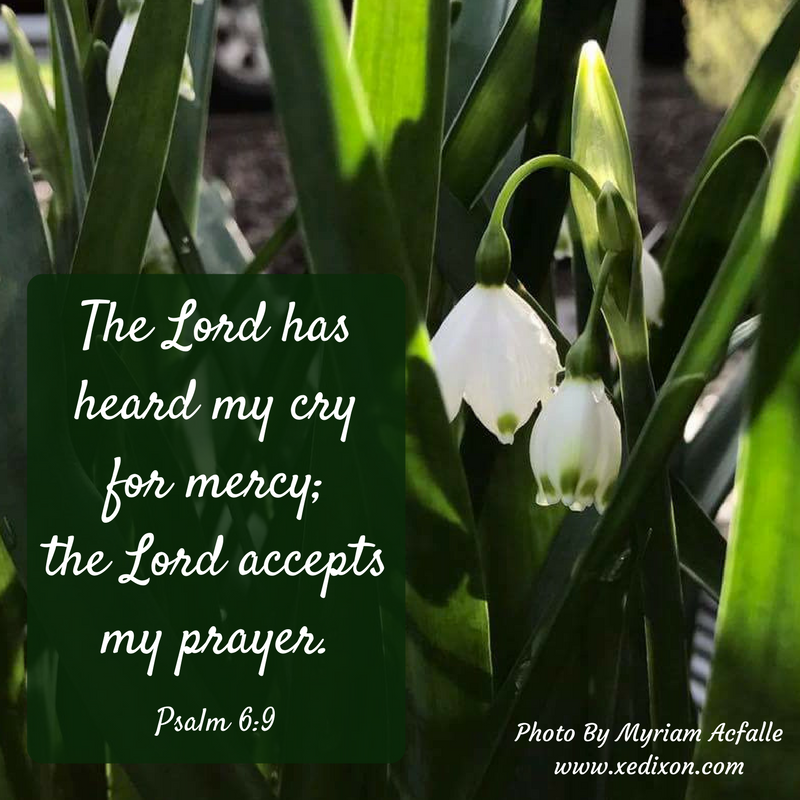 David pleaded for mercy and healing, admitting his agony courageously (v. 2). He despaired over the passing time, wondering when his suffering would end (v. 3). 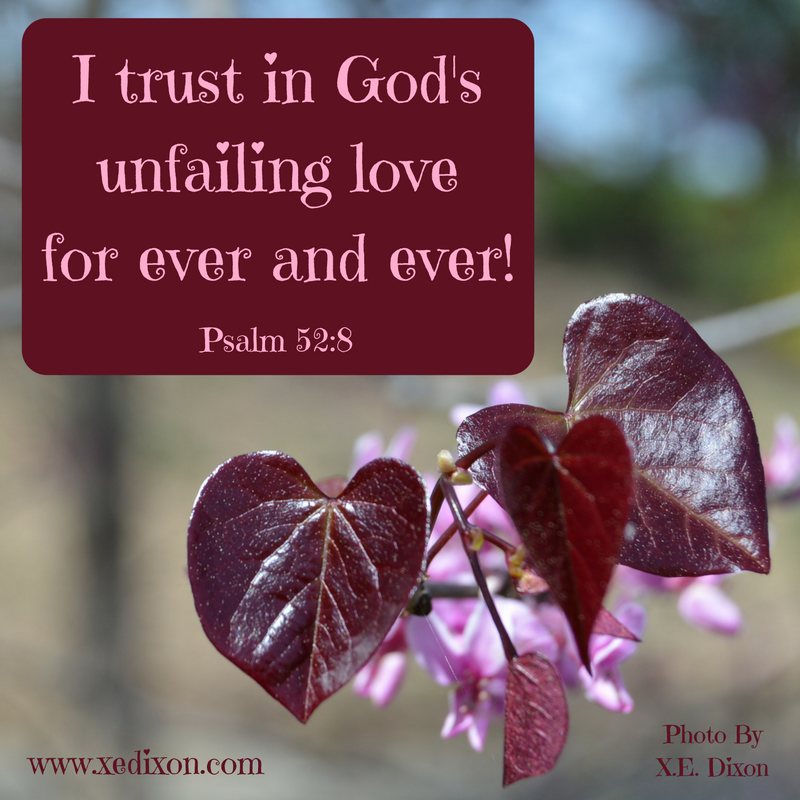 He asked for deliverance, confident in God’s “unfailing love,” in spite of his agony (v. 4). He confessed his weariness from weeping (v. 6). He acknowledged his loneliness, grief, and feelings of being under constant attack (v. 7). Still, David stood firm in proclaiming God not only heard but understood and accepted every one of his prayers (v. 9). Because no matter what we’re going through or how we feel, the Lord is God. He is able, loving, sustaining, and ever-present. We can love God through the most devastating valleys, trusting He knows suffering firsthand, knowing He suffered excruciating pain for us . . . for you . . . for me. Jesus endured physical and mental agony, as mockers spit on Him and abused Him verbally and physically. He suffered emotionally, after being abandoned, rejected, and betrayed by those He loved. 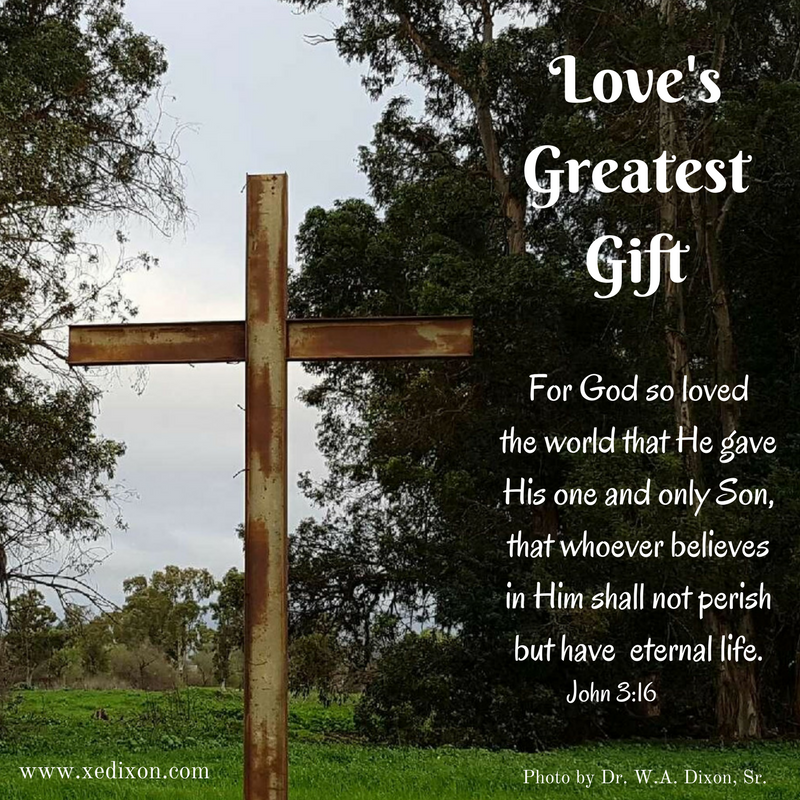 Christ, God in the flesh, underwent the most agonizing pain spiritually, as He willingly chose to be separated from the Father when He took on our sin, so that we could be saved through His selfless act of sacrificial love on the cross. There is no pain we can possibly experience that can outweigh the suffering our Lord and Savior willingly endured for us . . . because of His great love for us. We too can expect the Lord to answer. Whatever God’s answer to our prayers, we can trust with complete certainty that His will remains saturated in His infinitely satisfying love for us. Photo taken by and used with permission from Myriam Acfalle. Your Love is More than Enough, Lord! All-knowing Creator, Provider, Protector, and Lover of our souls, thank You for being a good, good Father. Please give us the courage required for stillness, as we breathe in the scent of Your dependable love. All we have in this world is worthless without You, Lord. When our hearts are tempted to wander, please secure our footing in Your unchanging and infallible Word. We are Yours, Good Shepherd and Wise Counselor. Photo taken by and meme created by Xochitl Dixon. Why Should I Love God When He Doesn’t Seem to Care About Me? Waiting can cause doubt quicker than a wasp sting causes a welt. Whether I’m waiting for an answer or relief, faith can falter in the stillness, the silence, and even in the slow-paced progression. It’s easy to think God doesn’t care about me when I feel like my prayers are falling on deaf ears. It’s harder to admit my dislike of waiting may be rooted deep in my selfishness and pride. I want to know now, have it now, do this or that now, even if I’m not ready. While God considers all of His beloved children all the time, I often succumb to the desires of my sin nature. I behave like a needy, spoiled, only-child. I insist, even if that insistence is passive aggressive, that the world revolves around me. I demand immediate attention, gratification, even rescue . . . now. I don’t want to wait my turn or give up my spot so someone else will be blessed. I don’t want a no, so someone can receive their yes. Why can’t we all have what we want? What I’m really saying is why can’t I have what I want. Self-first is as destructive as self-help. Both attitudes defy God’s interdependent design for His church and hinder me from developing the selfless loving heart that best reflects my Savior’s. These restless feelings slither into my relationships, my writing adventure, and even my attitude toward my healing journey, more often than I’d like to admit. I know God is working in wondrous way, in and through my waiting seasons. Still, some days are tougher to endure. Instead of waiting for His answer, I pout and start expecting His rejection. 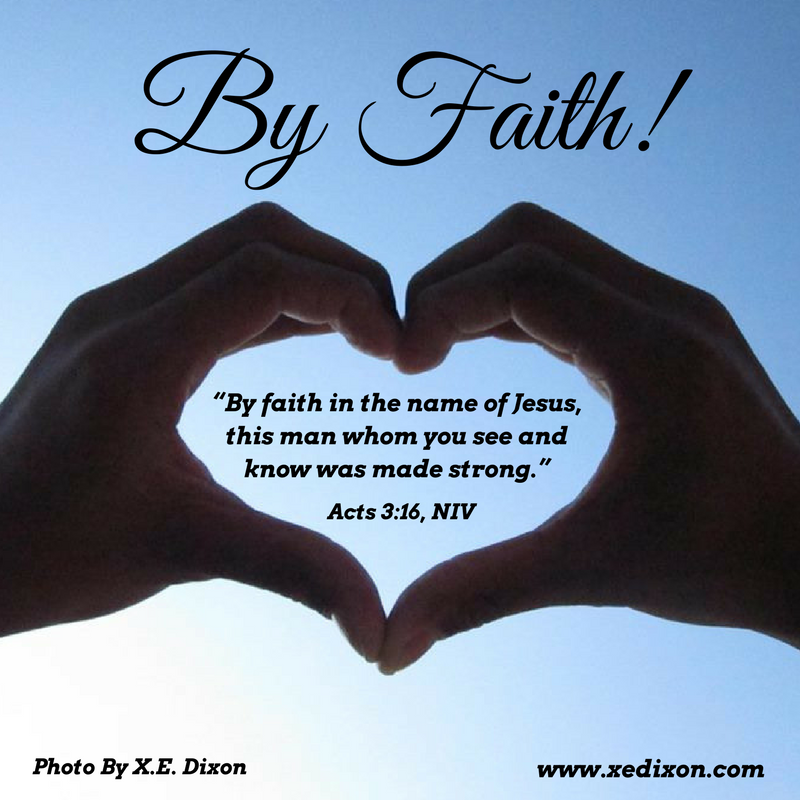 Confident faith fizzles into cowering fear of failure, even when I’m not failing. When I don’t get a quick response, I fear the worst and insist God must not care about me. What I’m really saying is poor me. Impatience and fear, which are simply different forms of unbelief, chip away at my peace, joy, and even my hope. If God truly wanted me to do this, He’d act fast and the road would be easy, right? Really? When has anything worthwhile come easy? Yes. Sometimes the wait brings out the worst in me. I laughed as I typed that last confession. Lord, help me! Ever since I started following God, He’s proven waiting is hard but never worthless and my waiting never, never, never means He doesn’t care. In John 11, Martha and Mary sent word to Jesus when their brother Lazarus was ill (v. 1-3). The Lord had made His disciples a promise, fully intending to keep His word (v. 4). Still, they were surprised at His extraordinary act of love. Yes. Jesus’s delay in responding to their pleas was a beautiful expression of His great love for His disciples (v. 5-7). The Lord could have sniffed and cured Lazarus, but His precious ones would have missed out on the glorious plan that would make many others believe in Him, the plan He had set in motion since before the beginning of time. 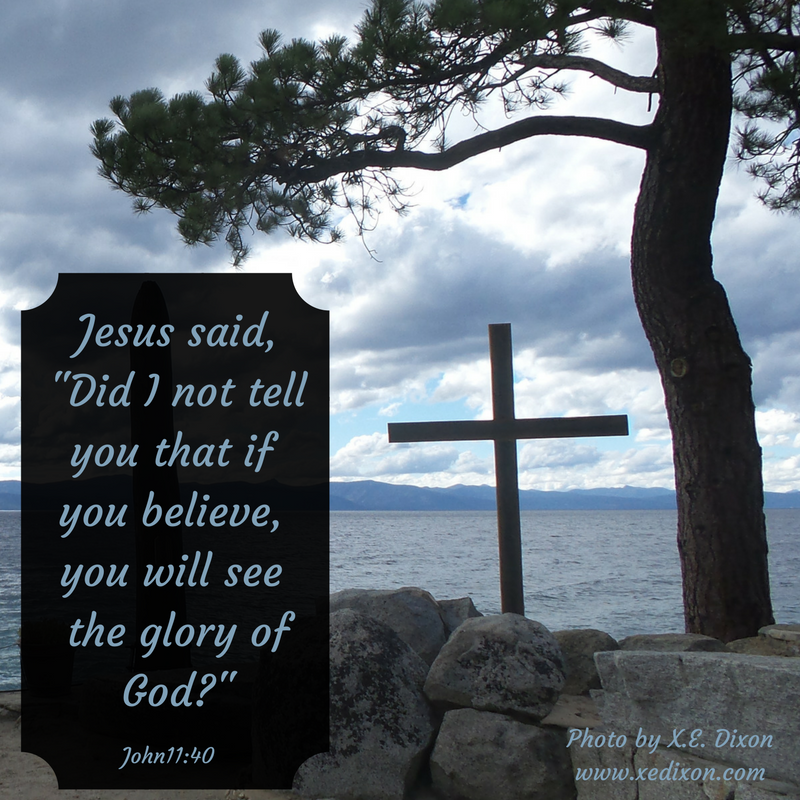 Jesus affirmed He would remain true to His promises, even though He didn’t have to explain or defend Himself (vv. 8-11). Whether His disciples understood His motives, actions, or lack of action (vv. 12-13), Jesus’s mission wasn’t about their comfort or meeting their immediate needs (v. 14). Our loving Savior understands it’s hard for us to see past ourselves, so He walks with us and sometimes reclines next to us, comforting us through our suffering (vv. 14-15). But He never stops caring about us or for us. Jesus maintains His pre-planned and perfect pace, pit-stops and all, even when we give up our peace to fret over the ticking clock and cry over His apparent lateness (v. 17). In His absolute goodness, He accommodates for our weariness and weakness, being loving and sensitive about our feelings and our unique relational needs (vv.20-36). Of course it’s tempting to doubt when we can’t see past our current situation (v. 37). Thankfully, Jesus patiently reminds us what He says is true (vv. 38-40). He does so many things for our benefit, affirming us even when we shouldn’t need affirming, especially when He knows our circumstances seem impossible or hopeless (vv. 41-42). When God seems silent or apathetic, we can dive into His God-breathed words of Scripture for all the truth we need. We can reminisce on our past encounters with the Lord or ask others for testimonies to strengthen our resolve. 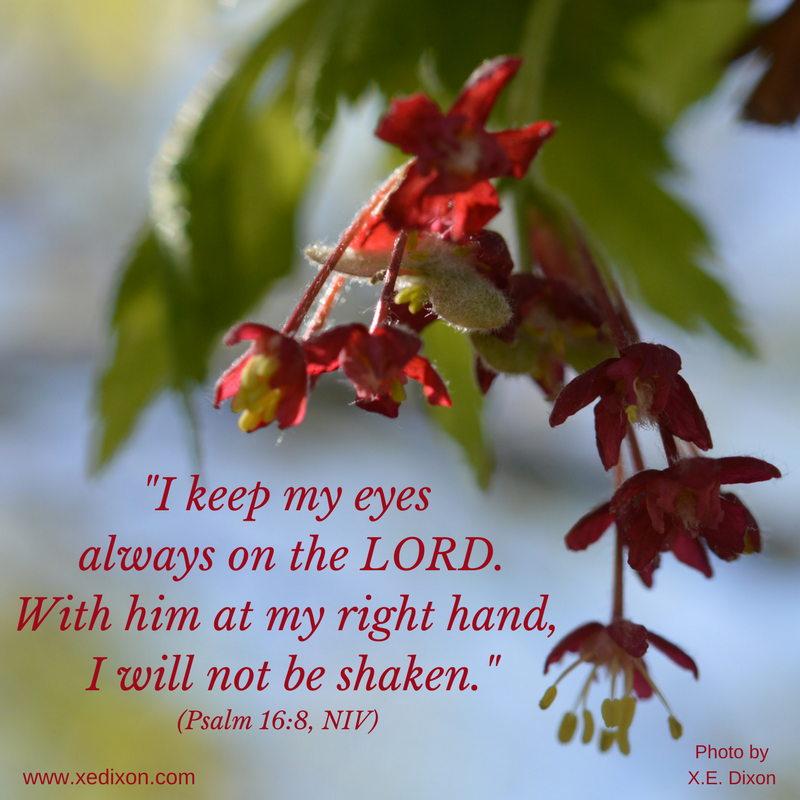 We can consider His unchanging character in the midst of our ever-changing challenges. Would we dare risk missing out on God’s beautiful promise to work in all things, for the good of those, all of those, who love Him, “those who have been called according to His purpose” (Romans 8:28, emphasis mine)? Why, oh why, would we settle for patching up wounds in hopes for immediate relief when our loving Father desires to give us a new life? 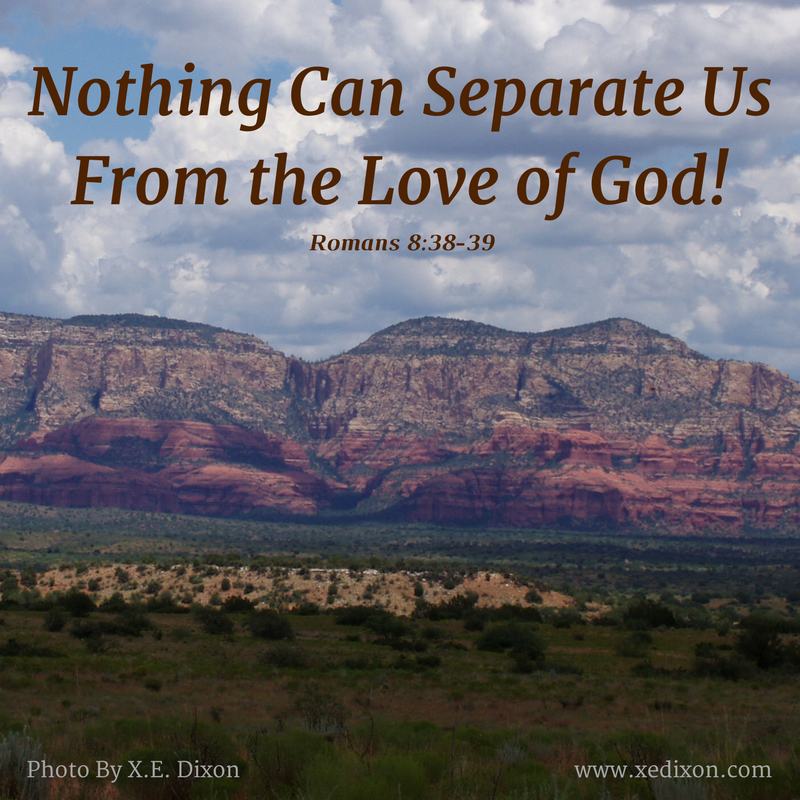 Why should we love God when He doesn’t seem to care about us? Because everything we know about our Heavenly Father, everything recorded from the earthly life and ministry of Christ, everything the Holy Spirit reveals through His Holy Word proves He is motivated by the unconditional, unmatched, and unending love He’s proven to have for us. Adoring and kindhearted Father, selflessly caring Savior, and intimately tender Wise Counselor, Your love is so worth singing about. Even when we’re pitchy or our voices crack, even when we can’t find the perfect words, when we encounter You personally we can’t help but praise You and proclaim Your perfect love to the nations, to every generation (v. 1). 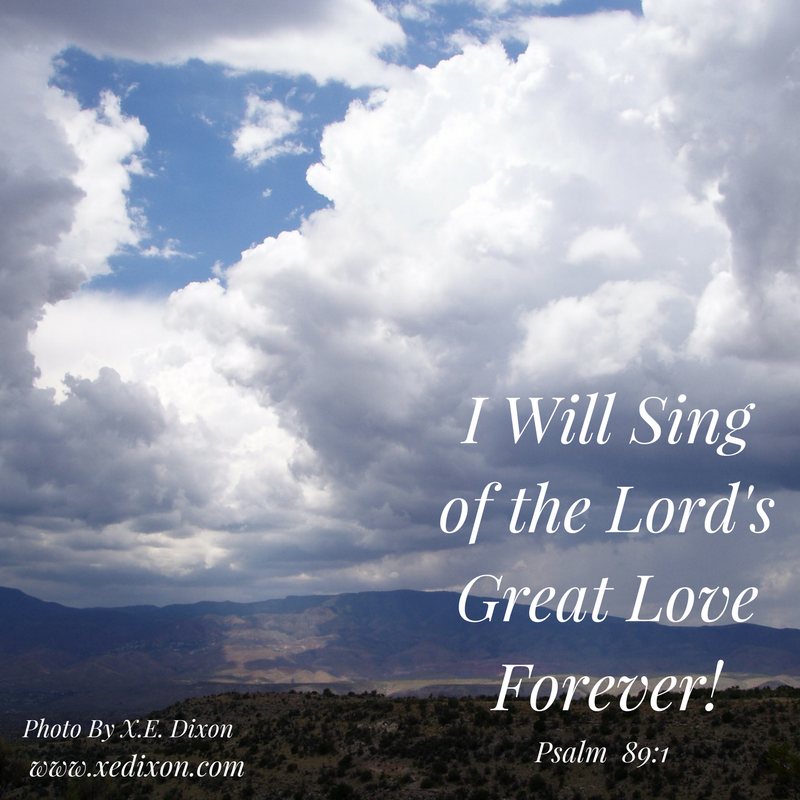 When we look to the heavens we see proof of Your eternal love. You paint the skies with reminders of Your unending adoration and faithfulness, yet Your devotion can never be contained, never be fully grasped (v. 2). Your attention to detail, Your creativity and dedication to designing beauty that none can equal or effectively capture are wonders to behold. A glance toward the horizon affirms Your dependability, Lord. You show up as consistently as the sun You make rise, the moon You make shine, and the earth You make turn on its axis. You direct the wind and control the waves, while maintaining the vastness of the universe You created and sustain. Each detail of Your glorious creation assures us we can never be out of Your infinite reach, never escape Your loving presence (v. 5). The wisps of clouds, the radiance of the sunshine, the landscapes too marvelous to be fully appreciated, all speak of Your limitless and incomparable love (v. 6). Mighty King of Kings, faithful Father, awesome God, You are worthy of all our praise, all of our reverence, respect, and unadulterated love (v. 7). No love satisfies like Yours, Lord Jesus. Nothing and no one can compare with You. Yet, You invite us to know You personally, to love You intimately. You fill our empty hearts with devotion that never runs dry (v. 8). Your compassion and mercy flow endlessly. Your great love covers us, hems us in, and wraps us up in a refuge sculpted and secured by Your unchanging faithfulness. Thank You, Lord, for loving us first, loving us completely, loving us even when we struggle with loving ourselves. Please help us receive Your love without question, without doubt, without hesitation, as we declare Your love is worth singing about, worth living for, and worth returning with all we’ve got. Why Should I Love God When He Doesn’t Give Me What I Want? Have you ever had one of those days when jealousy, frustration, bitterness, resentment, or even anger crushed every bit of your joy and gratitude under the weight of discontent? Have you ever struggled with wondering why God wouldn’t just give you what you wanted? Over the last five years, I’ve had way too many mini-melt-downs when facing setbacks in my healing journey. I’ve cried out to God with sobs and silent heart-wrenching prayers. Admitting my weaknesses, I begged for relief, for complete healing, for instant gratification to fulfill my I-want-it-now demands. Oh, how thankful I am for the Lord’s sovereign goodness. I’m grateful God doesn’t give in to my hissy-fits. I praise Him for knowing what’s best for me, for blessing me with redirection and deliberate delays. The more I see Him working in and through the circumstances He’s carrying me through, the more I’m beginning to realize I should be thanking Him for the silence that makes me turn to Him, depend on Him, submit to Him, and trust Him as He empowers me to surrender to Him . . . even when it hurts. I still require time to process my emotions and am thankful for those amazing prayer warriors that intercede with prayers on my behalf when I’m way-beyond-my-breaking-point. Don’t quit. Trust the Lord. God’s timing is perfect. God’s path is flawless. His faithfulness never disappoints. Those are messages I need to hear, reminders that comfort me and help me dust off discouragement and press on with renewed hope. When I release my selfish need for gratifying my sinful nature, which desperately wants to avoid suffering by any means necessary, I discover peace resides in the eye of the storm. Cleaved to the Rock of Ages, Jesus Christ my Lord and Savior, I discover peace and joy ingrained in the fibers of my being. That peace and joy become a part of me, instead of a feeling dependent on my circumstance or my emotional state. That peace and joy, rooted in an unshakeable hope in Christ, become a fragrant offering to others. Often, it’s when we feel like we have nothing to offer that God uses us to affirm His faithfulness and encourage others toward persevering faith. We may not be able to take away anyone’s pain or meet all, or any, of their physical, emotional, spiritual, or mental needs. But we know the One who can replenish empty wells, restore damaged roots, and rejuvenate weary souls. Completely dependent on the abundance of God instead of our own power, or lack thereof, we know Christ is the best we have to offer others in need, no matter what their needs. When the apostles Peter and John were headed to the temple to pray (Acts 3:1-16), a beggar asked them for a temporary fix (v. 3). How often do we sell God short, begging for temporal solutions and quick relief when He offers so much more? This beggar focused on his current problems. I admit there have been times when I’ve approached God and others with that same needy attitude. The apostle didn’t mince words when he responded to the beggar’s request. He told him to look beyond the now. He cast a vision of hope and healing that this man, who’d been lame from birth, had probably never dared dream possible. The beggar had asked for a quick solution to his present needs, for temporary relief of his surface problems. The apostle introduced him to Life. The lame man walked and jumped, praising God (v. 8). His existence became a testimony of the Lord’s power and mercy, causing others to stand amazed at what the Lord had done (vv. 9-10). But the miracle didn’t end at this man’s ability to walk. When this man received his deliverance, he could have said thanks and settled right back into the safety of complacency we often confuse with contentment. But Scripture says “the people saw him walking and praising God” (v. 9). He moved forward, bringing God glory with every step, every breath, every word he spoke when he explained what had happened to him. He became a living testimony of God’s loving mercy and life-changing power. Peter gave God all the credit He deserved (vv. 11-12). He pointed to the Savior with adoration and grateful worship, turning the focus back to the foundation of their faith−Jesus, always and only, Jesus (vv. 13-16). Because of our human frailty, we often desire instant gratification and relief. We’re often limited by our inability to hope, to believe there is more to life than just getting by or surviving. God offers us unlimited freedom, joy, power, and peace that cannot be constricted by our past or current struggles or strife. What a sad moment it would be if God granted us what we wanted, only to discover He was prepared to offer us an abundance we’d never imagined possible. Why should we love God when He doesn’t give us what we want? Because our all-knowing and never-changing Lord is loving, faithful, trustworthy, and good. Our Heavenly Father sees beyond our begging for bandages, our frail hopes to alleviate discomfort for now. Our Good Shepherd uses every experience in our lives to refine our character. By the power of the Holy Spirit, our loving Lord Jesus Christ makes us more like Him, preparing us to walk the path from better to the Father’s best. Describe a time when you were upset that the Lord didn’t give you what you wanted, only to realize He had something better in store for you. Lord, our faithful Stronghold, our loving Father, our Good Shepherd, our just Deliverer. There is nothing You can’t do. There’s nothing more You ever need to do to prove Your love and grace are sufficient to save us, to change us, to carry us through every situation. Almighty Jesus, thank You for knowing we needed a perfect Savior to die for our sins, a perfect Savior to pay the immeasurable cost for our salvation, a perfect Savior to rise so that we would serve You, our living King. When we face opposition and the victory always seems just out of reach, please help us trust You to work in and through all circumstances for the good of all who love You, honor You, and follow You. Loving Redeemer, You’re the only One who can use our biggest failures, our worst shortcomings, our greatest struggles to mold us, shape us, and make us look more like You, while using us to serve others in Your name. Please help us live each day confident in the rewards of trusting Your unfailing and unfaltering love. Help us give ourselves to You and others without fear, knowing our everlasting hope, our eternal security is in You because You are completely good. Why Should I Love God When I’m Rejected? Eight year old me didn’t like baseball, at all. Still, my dad insisted I participate. Although one day I’ll share the miracle story about the only time I ever caught a fly ball, I couldn’t catch a ball to save my life. I still haven’t hit a ball and I’m well over a few double-digit birthdays. I enjoyed dancing, singing, drawing, acting, reading, and writing. So being picked last for a baseball team didn’t surprise me. My teammates’ responses, however, shocked me and wounded my tender heart. Don’t let her play. She stinks. She always strikes out. She can’t even catch. She’s a loser. I wish I could say that was the last time I ever felt like a total reject, but it wasn’t. Growing up, I never found that place where I felt understood, accepted, or even liked. Although in high school I managed to put on an act of apathy laced with an attitude that could have been confused with confidence or even arrogance, insecurities and fears plagued me. As I fought inner battles and nursed deep wounds, I pretended I didn’t care who liked me. I even behaved like a bully at times, proving that familiar saying: Hurting people, hurt people. Not liking myself led me to a stream of bad choices that stained and scarred my body, mind, and spirit. I’d mastered that life until I met my husband. We lived in sin for over a year before getting married then suffered the devastating loss of our first child during the second year of marriage. Viewing the Lord as a punisher, before I knew Him personally, I thought He was punishing me for all the bad things I’d done. I thought I knew what God thought about people like me . . . sinners . . . rejects. I was wrong, wrong, so wrong. But when grieving our first child overwhelmed me, I crawled through depression. A few friends tried to introduce me to Jesus. They encouraged me to pray, but my prayers back then were rooted in fear . . . and shame. Wallowing in heart-wrenching sorrow, I considered divorcing my husband. I felt utterly alone. I’d never even seen a real Bible and I trembled at the thought of stepping into a church. How could I turn to God after I’d lived my life rejecting God, certain that He’d rejected me and would continue rejecting me? After a few long pain-filled years, with loved ones praying for my salvation, I finally surrendered my life to Christ. And yes, God restored my marriage, blessed us with a beautiful son. Alan, Xavier and I were baptized in August 2003. Hallelujah! Still, I doubted God would fully accept me. Considering the sins I’d racked up in my past and the sins I still struggled with, I treaded carefully on the edge of faith. But as I continued prayerfully reading Scripture, I discovered how God loved people who others rejected, people stained with sin, people who struggled with sin . . . people like me. I couldn’t stop myself from falling in love with Jesus. One of the stories that still triggers grateful tears is found in Matthew 8:1-4. Lepers weren’t greeted by others, welcomed into homes, or comforted with hugs. So, when a man with leprosy approached Jesus, it’s easy to imagine the crowd scattering in fear of the man’s contagious skin disease. This man braved the scorn, desperate but confident that the Lord could help him. He knew Jesus was able, if only He would be willing. Did his chest tighten, his lips quiver, his hands tremble? He knelt before the Lord, probably having heard how Jesus could heal with one spoken word. Then, the remarkable happened. The Lord spoke clearly, “I am willing,” and reached out to touch him. Jesus touched the rejected one, the marginalized one, the forgotten one. Jesus touched the despised one, the feared one, the lonely one. Jesus touched the grieving one, the desperate one, the condemned one, the hopeless one. He cleansed this man beyond the surface wounds others could see and sent him to be a living-testimony of God’s life-transforming love. He wants to do the same thing for us, for me, for you. Jesus is willing to reach out and touch us with His mighty and merciful love. We are wanted, accepted, and loved by our Savior. We’re always within His reach, because He’s always with us. Not only does He think we’re worth dying for, He knows we’re worth living for. The love of Christ changes us, healing wounds others can see and the deep scars we thought we were able to hide. His love invades our personal space, seeping into every crevice of our armored hurts, coaxing us into a confident, courageous, and contagious faith. Wherever we’ve been, wherever we are, Jesus reaches out to us and invites us to be cleansed by His limitless love. He empowers us to shrug off the chains of our false identities as rejects, so that we can experience the rewards of righteous living empowered through the Holy Spirit. Have you ever struggled with feeling like a reject? How has God helped you feel accepted, loved, and valued as His child?